Sainsburys | Can I choose the weight of a product more suited to my needs? > Can I choose the weight of a product more suited to my needs? You have told us you want the option to choose more specific size of product on meat lines. From the 18th of November you will have the option to choose a weight band most suited to your needs. This is a trial and the option will only be available on selected beef and turkey products. What will happen to the weighted product already in my trolley if I add the same product but select a different weight range? If you add the same product with a different weight range then it will overwrite the weight range already in your basket. For example – in the basket there is a Beef Joint 1kg-1.5kg and you then add the same Beef Joint but 1.5kg-2kg then both Beef Joints in the basket would become the 1.5kg-2kg weight range. If the weight range of the product I have ordered isn’t available will I get the same product but another weight range? Yes – The pickers in store have been instructed to pick to the higher weight range when the ordered weight range is not available. If the weight range of the product I have ordered isn’t available will I get a different product within the same weight range? If the picker in store is unable to pick the weight range requested they will attempt to pick a larger weight range for the same product. If they are unable to do this they will pick a different product and use the original weight band requested. If the product I have ordered is not available in any of the weight ranges will I get different product with the same weight range selected? Yes – the picker would use the existing substitution rules to select a product and use the weight range requested. What will happen if the weight range product I have ordered is not available? The picker would use the existing substitution rules to select a product and use the weight range requested. If my item is substituted what weight range should I expect to get my product from sub up or down? The in store pickers have been instructed to always pick to a higher weight, this is to ensure you get more than you wanted rather than less. You are still able to reject the substitution at the door step. If my item is substituted will I get charged for my selected weight band or the band above or below? You will be charged for the weight band of any substitute. This is in line with current substitution rules. Can I have more than one weight range product in the trolley at the same time? Yes – however you can only have 1 weight range per product in your basket. Can I still add a weight range product without selecting a weight range? Yes – when you come to the product on the shelf or product page the drop down where you select a weight range will by default be set to the smallest range. If I have a product in my favourites that has now become a weight range product can I still add the product from my favourites without the weight range? The product in your favourites will default to the smallest weight range for that product. How will the weight range product I have selected appear in the trolley? The basket will still show the Product Description, then below will state “You Chose” then the weight range selected by you. How will the weight range product I have checked out appear on my online confirmation? The summary will show the Product Description, then below will state “You Chose” then the weight range selected by you. How will the weight range product appear on my receipt when delivered? The product will appear on the receipt as it currently does – there is no change to this. How will I know what I will be charged for the weight range product I have selected? When you add your selected product and weight range to your basket the price shown is the maximum price you will pay for that weight range. This means you will pay either the price shown or a lower price. If you receive a substitution this will be flagged on your paperwork and you will be able to find the new price on your receipt. If I have promotional voucher with a minimum spend threshold what will happen if the weight range item brings the total below this threshold? This would mean you would be below the minimum spend and would need to order additional items to bring the total cost of your shop up to the required amount. 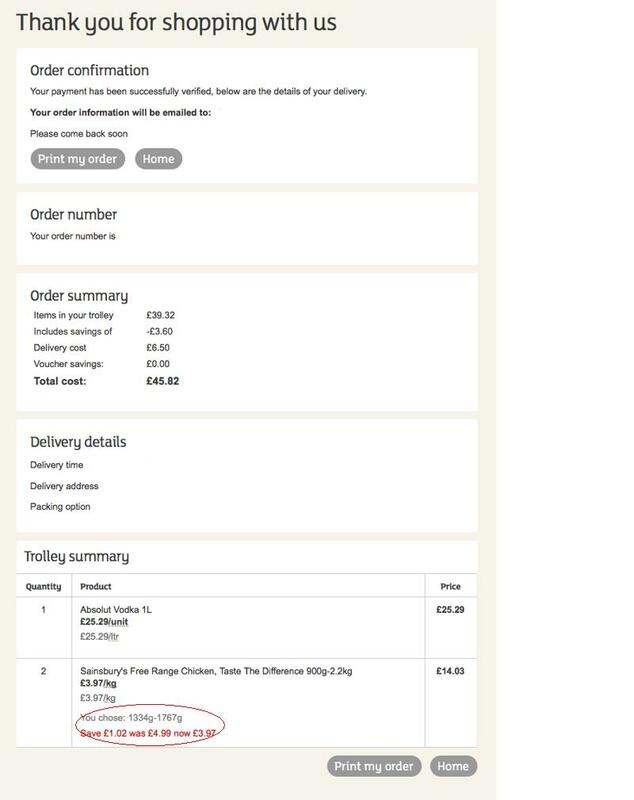 What will happen if my order is just over £40.00 (the threshold for my delivery pass to work/ threshold before being charged the maximum delivery fee of £6.95) and the weight range product delivered is less than the amount stated on the online confirmation resulting in the order total being brought below £40.00, will I be charged the maximum delivery fee? How many weight ranges are there available for a weight range product? The maximum weight range will be three. Some products can have two ranges while others will have three. How will I know how many people the weight range serves? If you buy one of the selected turkey products you will be able to see serving information in the drop down when you select the weight. Unfortunately, this is not available for the selected beef products.